John Deviny, author of “Exploring Washington’s Backroads,” was kind enough to give me a copy of this most intriguing book. It’s a short, concise volume packed with trips throughout our state that anyone, traveler or local, would enjoy. Photos on every page just make the enticement more alluring. Deviny has divided the state into what her calls “Backroad Trips,” 17 of them to be exact. 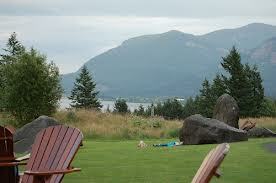 View from Skamania Lodge in the Columbia Gorge, which is also mentioned in the book. Each of the trips describes the general location, “Sights and Scenes” not to miss and a route to follow that truly depicts the culture and personality of the area. For example, “Backroad Trip 2” loops you through the Black Hills of the Puget Sound region in Thurston and Grays Harbor counties. In our Capitol, Olympia, you begin the journey and then drive through forested hills above the Chehalis and Black River plains through old timber towns and quaint businesses. Be sure to investigate the magical Mima Mounds. You visit towns like McCleary, which actually holds a Bear Festival (July 12-14, 2013), and where the door factory is still in business wafting off the smell of sawdust to remind you it’s a mill town. Each trip holds surprises and new information (even to me) so when you’re ready to discover small-town Washington, I urge you to order this book, pile the family in your car and head on down the road. You’ll be glad you did. 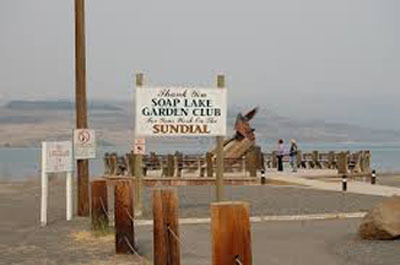 Soap Lake, also mentioned in the book, has a new sundial. This entry was posted in Books, Fairs and Festivals, Family Fun, Hotels and Other Lodging, Towns and tagged back roads, Bear Festival, Exploring Washington's Backroads, John Deviny, McCleary, Mima Mounds, Olympia, Puget Sound, small-town Washington, trips on January 22, 2013 by admin.